Okay, I know I promised mince pies this week but I just had a craving for custard tarts that wouldn't go away. So we will do mince pies sometime soon (before Christmas - I promise). I have tried commercially made custard tarts in Canada and have met with some real shockers. One baker (who, mercifully, is no longer in business) made custard tarts with custard sauce (you know the corn starch based stuff that tastes great with dessert but is disgusting when baked in a pastry shell). Another baker failed to pre-bake the pastry shells before filling them. The result was custard tarts with soggy bottoms. To be honest, I can't make them taste quite as good as the delicious tarts you find in many small British bakeries over 'ome. But, mine are pretty darn good all the same. 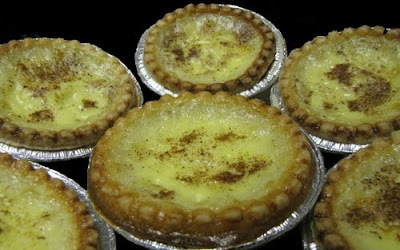 A good custard tart is well filled with custard. The pastry shell MUST be lightly pre-baked. If you try to bake the custard in unbaked pastry shells, the custard will cook but the pastry will remain uncooked and taste 'orrible. I like lots of nutmeg on my custard tarts. Custard tarts must be made with real custard which means custard made with eggs and milk. Contrary to popular opinion the stuff the English usually pour over desserts is not real custard at all. 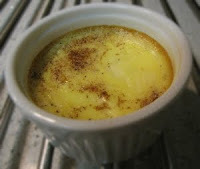 Custard thickened with corn starch was invented by a famous Mr Bird whose wife loved custard but was allergic to eggs! You can read all about custard in our earlier post "English Custard". And finally, if you just want to enjoy the custard without the pastry shells then make "custard cups" by baking the custard in small ovenproof dishes.